The Traditional Danish Food and Take-Aways. 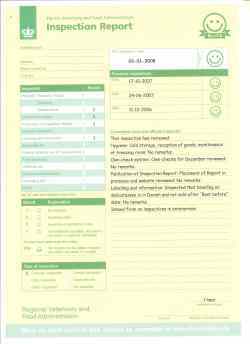 The Danish food safety is high and one of the reasons is the SMILEY system that was introduced in 2001, by The Danish Veterinary and Food Administration. Smiley reports are to be displayed so they are visible before you enter the premises, on the window or door, in all shops, restaurants and other businesses selling food and beverages to the public, such as supermarkets, groceries, butchers, greengrocers, bakeries, canteens, pizzerias, hospital kitchens and even the hot dog stands on the street. The report must also be available on the business home page if the business has a web page. The smiley scheme is very popular among the Danish food consumers, and food enterprises, and is used in advertising today as well. The sour smiley is therefore bad for business and they aim for a better report and a bigger smile on their smiley. If out shopping for Danish food, getting a takeaway or dining in a restaurant, remember to have a look at the smiley, if it hasn’t got a big smile on, then I suggest you read the report. The Danish idea with the smiley-report has been studied by a lot of health departments all over the world, and now Berlin in Germany is on the way with a similar system. For recipes and information about Danish butter cookies go to Danish Butter Cookies. If, while you’re in Denmark, you are invited for a cup of coffee, a birthday party, a breakfast or any other function you will most likely be served Danish Pastry. The Danish Pastry comes in a lot of varieties and is well known all over the world, but having said that, travelling the world you will find a lot of stuff called Danish Pastry where the only comparison is in the name. 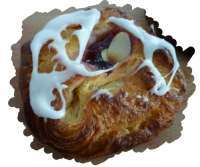 The Danish Pastry is not really a Danish invention, probably a surprise for you? In the last half of the 18th century a lot of bakers and pastry cooks from Europe, mainly Austria, moved to Copenhagen and other parts of Denmark, due to a shortage of trade people in Denmark. In the beginning of the 19th century more than 50% of the bakers and pastry cooks in Denmark were foreign, and by 1820 a new law was put in force in the country to stop foreign tradespeople to enter Denmark. Due to this new law, the Austrian bakers now had to employ Danish workers, who picked up on the secret from the Austrian tradespeople, how they laminated the dough and the fat, and they changed the recipe by adding more fat. Margarine was developed in 1869 and the first Danish margarine factory opened in 1883 by the grosser Otto Mønsted. And as the margarine got better so did the Danish Pastry. For more information and recipes see Danish Pastry and Recipe. The Danes love their food and their “hygge” properly best described like, cosines mixed with a couple of candlelight’s and a glass of wine and some music. 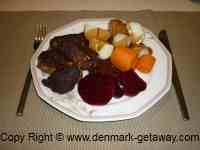 The traditional Danish food is somewhat heavy, properly due to the long winter and cold climate. What we call traditional Danish-food can wary a lot, depending where in Denmark you are. Most Danes eat cereal or buttered white bread, rye bread, or “rundstykker”, a Danish tradition that comes in a lot of varieties with names like; horn, birkes, spanske rundstykker, haandvaerker and krydder just to name a few, with jam, cheese or some other kind of spread, and quite a lot of coffee and maybe even a shot of Old Danish, a Danish bitter. It is quite common that there are big queues in front of the bakeries in the morning, especially on a Saturday or Sunday morning when the Danes pick up their bread rolls and Danish pastry “wienerbrød” that also comes in a big variety. 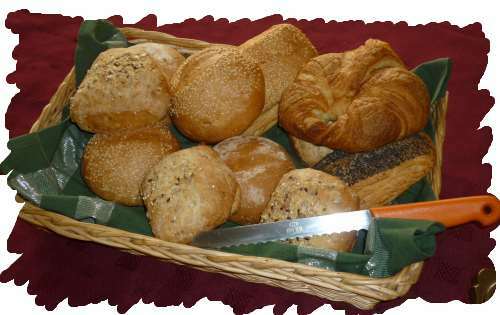 The breakfast, especially on weekends is usually eaten around the dining table together with the whole family. Most Danes bring their lunch from home and most of the time they have a downgraded kind of "open sandwiches", ryebread with sliced meat. However many companies in Denmark today have canteens where the staff can buy their lunch and some where they even get their lunch for free. The Danes like to invite people for dinner, like a get-together over a 2 or 3 course meal on a Friday or Saturday night. If you are invited for a dinner at a Danish family you should show up at the time you are invited, you can’t really show up an hour or two later like some people do in a lot of other countries, because it will most probably be a sit down dinner. It is also a custom to bring a bunch of flowers for the lady of the house and maybe a bottle of wine. Most families still sit together at the dining table for the dinner every night. The Danish national dish is “frikadeller” Danish meatballs served with potatoes and brown or white gravy and red cabbage or beetroot, or sometimes served with warm or cold potato salad. Even the plain meatballs usually taste quite delicious the way they are made in Denmark. For recipe on Danish Meatballs see here. Some other common Danish food dishes are “hakkebøf” made from beef mince. “Lever” Fried pork lever with fried onions and mushrooms, is also a Danish food. “Medisterpølse”, a thick sausage made with finely minced pork. The Coffee table in South Jutland. South Jutland is known for the extensive amount of pastries and cakes they serve at the coffee table. It is believed that it all started in 1864 when Southern Jutland was part Germany. Back then a lot of community halls were built where the Danish people had meetings. At the meetings they served coffee and cakes. Before the speeches the plates with cakes were passed around and people filled up their plates. That way the people were not interrupted during their speeches. There are usually at least 14 different cakes, seven soft cakes and seven hard cakes. You usually start with a bun and some kind of Danish pastry. The Old Tavern (Den Gamle Kro) in Graasten every 2nd Sunday of the month. Eating at restaurants in Denmark can be rather expensive due to the country’s high taxes and wages, but on special occasions when the Danes go to restaurants it is quite normal that a meal lasts 2 to 3 hours. The country has a lot of nice restaurants and in the countryside you will find something like the inn, in Denmark called “Kro” where you can stay overnight as well. The "Kro" are most likely to have ordinary Danish-food on their menu. The Danish Hotdog van, in Danish “Pølsevogn” and “grill bar”, goes back a long time and is still very popular in Denmark, over the last couple of decades a lot of other take away shops like Pizza shops, McDonald’s, 7-eleven, Burger King and other fast food shops have entered the marked. The hot dog van can be found in just about any town in Denmark, here you can get the popular red sausage served with a bun, ketchup, mustard and remulade, a hotdog with toppings like ketchup, mustard, remulade, fried onions or raw onions and thinly sliced cucumbers on top. 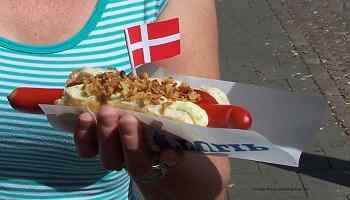 A typical Danish food. 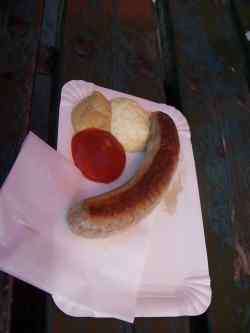 You can also get a big variety of other sausages like grilled medister, grilled frankfurter and sausages wrapped in bacon, and the French hot dog is available at most hot dog vans as well. On a cold day at a hotdog stand, the best you can get is a hotdog and warm choc milk. 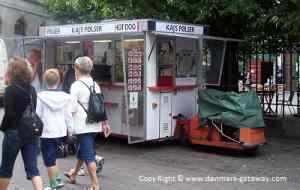 A Traditional Danish Hotdog Van. The grill bar in Denmark goes back a long time and can be found in most towns as well, back in time it used to be the ½ chicken and fries or potato salad that was on the menu, but today the menu has extended to just about any fast food including burgers and pizzas. Go from Danish food to Home Page. Go from Danish-food to Danish Traditions. Go to Danish Pastry recipes.